Click for the filling ingredients you can use. In a bowl, place the eggs, oil and milk. Mix them with a whisk. Take 1 cup of this mixture and set aside to use later for the top. If using Turkish yufka, place all the yufka sheets on top of each other. Cut them in four by obtaining equal triangle like pieces. Then, put 2 tbsp of milk mixture on every piece and spread with the back of spoon or use a brush to spread all over. Place 2 tbsp of the filling on the wide edge and spread evenly through the edge. Flap the wide edge inside and roll it up till the end (make sure not to roll too tight). Then, again roll this long piece forming a spiral shape (see the picture). Repeat the same procedure for each of the yufka piece. 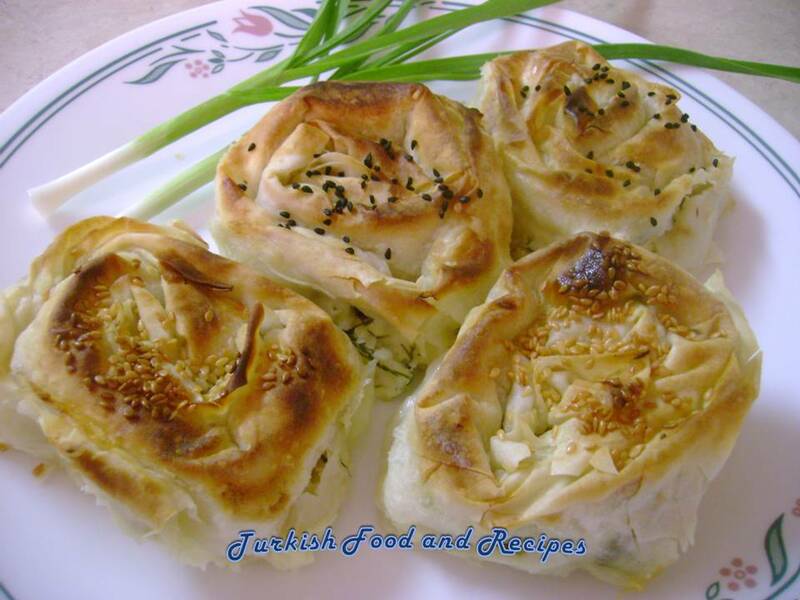 If using Phyllo Pastry, use two piece of pastry sheets at the same time to form a rose borek (two sheets aproximately have the same thickness as one yufka sheet). Place the filling on the wide edge of the rectangle sheet and then roll it up till the other end. Give the spiral shape and use the same procedure as you’ve used for the yufka. 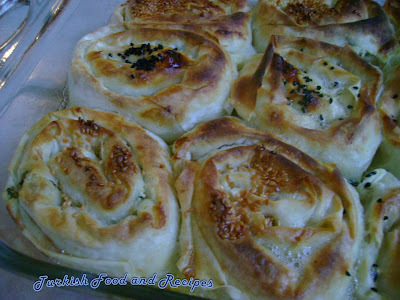 Place the rose shape boreks side by side in a greased Pyrex dish (do not leave any room in between). Pour the remaining liquid mixture on top of the borek evenly and sprinkle with nigella and sesame seeds.Preheat the oven to 350 F(180 C) and bake for about 30-45 minutes, until it turns golden brown. Serve warm. Ic malzeme cesitleri icin tiklayin. Bir kasede sut, yumurta ve sivi yagini karistirin. Karisimdan bir su bardagi alin ve daha sonra uzerine kullanmak icin ayirin. Eger yufka kullaniyorsaniz butun yufkalari ust uste koyun ve esit bir sekilde ortadan dorde kesin. Her parcaya yaklasik 2 yemek kasigi sutlu karisimi yayarak firca ya da kasigin arkasi ile surun. Sonra, her parcanin genis kismina kullandiginiz ic malzemeden 2 yemek kasigi kadar malzemeyi esit sekilde dagitin. Genis kismi ice dogru kivirin ve uc kismina kadar cok siki olmayacak sekilde dolayin. Elde ettiginiz uzun parcayi bir ucundan tutarak sarmal seklinde etrafinda dolayin (resime bakiniz). Her yufka parcasi icin ayni islemi uygulayin. Eger fillo pastri kullaniyorsaniz; iki kat pastriyi ayni anda kullanin (pastriler ince oldugu icin iki kat pastry yufka kalinligina denk gelir). Dikdortgen seklindeki parcanin genis kismina ic malzemeyi ayni sekilde dagitip, rulo seklinde sararak gul seklini verin. Yufka icin yapilan ayni islemi uygulayin. Yaglanmis firin tepsisine gul borekleri yanyana araliksiz sekilde dizin. Geriye kalan sutlu karisimi esit sekilde boregin uzerine dokun ve susam ile corek otu serpin.Onceden isitilmis 180 C (350 F) firinda uzeri kizarana dek, yaklasik 30-45 dakika pisirin. Sicak servis yapin. I am Yasemin. A native Turkish who lives in the UK, nottinghamshire, who loves Turkish food. Any tips where I can get fresh Turkish cooking ingredients which is not over priced!!! !